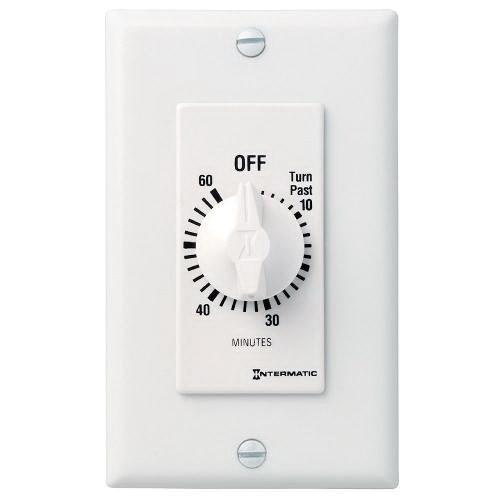 Intermatic FD Series 1-Pole Decorator style spring wound countdown timer in white color, is rated at 125-277-Volt AC. It features auto-OFF action and SPST contact configuration to provide maximum conductivity. It has contact rating of 10-Amps at 250/277-Volt AC, 20-Amps at 125-Volt AC resistive and 7-Amps at 125-Volt AC incandescent load rating (multi-gang). Timer has maximum breaking capacity of 1 hp at 125-Volt AC and 2 hp at 250-Volt AC motor. Timer features front terminal to offer better wiring connection. It has timing range of 60 mins. Timer is suitable for bathroom fans, spas, hot tubs, storage closets and garage lights. It automatically limits On time for energy consuming loads. It measures 44.5 mm x 31.8 mm x 104.8 mm. Wall mountable timer withstands temperature rating of 0 to 40 deg C. Timer is UL listed and CSA certified.